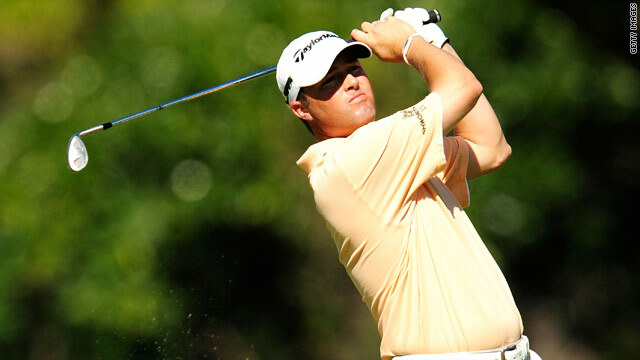 American Ryan Palmer continues to set the pace going into the final round of the Sony Open in Hawaii. (CNN) -- Robert Allenby, who is coming off wins in Australia and South Africa at the end of last year, fired a three-under 67 to join Ryan Palmer in a share of the lead after the third round of the Sony Open in Hawaii. The 38-year-old Australian -- who is seeking his first PGA Tour win in almost nine years -- played through the pain of a sprained ankle that he hurt on Monday before the tournament started. He tested the ankle in Wednesday's pro-am and then decided to give it a go for real on Thursday. So far the decision has paid off, going 32 holes without a bogey. "Scoring was tough this afternoon, especially on those greens," Allenby told reporters. "I just went out there with a game plan to just hopefully keep it on the fairway and keep it on the green and try and make a few putts." American Palmer, who is protecting just the second 36-hole lead of his career, shot a two-under 68 to be paired with Allenby at the top of the leaderboard. "If you'd have told me I'd have shot two-under par, I would have said 'Great, let's go home,'" Palmer said. "It was actually a very solid day of golf." The pair are on 11-under 199 for a three-stroke lead over Steve Stricker (69), Davis Love (68), Troy Matteson (68) and defending champion Zach Johnson (70). Five more players, including SBS Championship runner-up Rory Sabbatini (67) and Tom Lehman (68), are another shot back on seven-under 203.